Traditionally, most people made their living from livestock, although small-scale mining has a long history in the mineral-rich region. As the industry developed, it became the main source of income, attracting not only locals, but workers from other areas. Many narrators give vivid accounts of the hardships of being employed in the mines, and of the struggle to improve working and safety conditions (see especially 12, 18, 21 and 24). Today, mining is being mechanised, and jobs are no longer secure. Some see a conflict of interests for miners, dependent for their salary on an industry which is polluting the surrounding environment, and so reducing the viability of local agriculture. Yet, as several point out, the need for employment and the nature of the work itself engenders a different outlook to those working the land - a mind-set which ignores the long-term. Even the mining camps, on the one hand a welcome source of housing, contribute to a certain isolation. Some local people combine farming and mining. Other sources of employment are sand extraction, weaving and other small businesses, but as the communities shrink and young people move elsewhere for work, so do the options for trade. Miners who lose their jobs and have no land, or whose pastures and herds have suffered from the pollution, have few prospects of earning an income. "One thing's for sure, there's not much future round here. You can only be a miner round here because you can't live from being a community member, working the land, the farm. The people who work the farm do it as an extra, they have to work in the mine or as a trader or in transport too. You can't live from farming any more the way our grandparents did." "[Being a miner] was a change, life in a community is always different, it's more peaceful. The timetables are different in the community; the hours are more rigid in the mine, if it rains, thunders, you still have to do the hours.... What's more, a miner, to be honest, is only interested in his salary - how much he earns and that's all - that's the bottom line." ". as times goes by, one notices that in a [mining] camp one lives locked up and removed from world, from the outside..The miner believes that if the work ends.the world ends, that he can't do anything else. 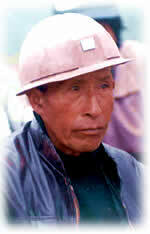 That's why the miner from the Sierra, the Andes, looks sad, because he is locked up, he doesn't have true freedom. Since I became a union leader I realised that the company played like that, that it was convenient"
"I told you that before there was wool in abundance, the crafts were famous as well, not like now... people came to buy, for example from Huancayo, from Jauja. We used to exchange things: they brought vegetables, clothes; from here they took meat, wool and weavings.. Nowadays we see two or three little shops; before, all these [streets] were full of shops." " [Today] parents encourage their children to be professionals so that they never lack work and they can improve themselves - that's the goal of every parent. But, at times, because of the crisis in the country, they can't find work even if they study and even if they are engineers they end up being street vendors." "[Most community members] can no longer dedicate themselves to [farming]. All of them work independently.the majority work for the company, now Centromin. Others are informal vendors; others do construction work. These are the only occupations the Saco community has here, there are no others [because the land is polluted]. some have left the country. Some paisano (fellow countrymen) are also in the United States, others in Germany, and a sister in Italy. Also, from here, from Saco, they have gone to Huancayo or to Lima."